Oh the Fed is going to increase rates. Oh this is the correction we have all been predicting. It hasn’t even reached below the trendline or below it’s 50 day moving average. In reality we are still higher than we were in August. 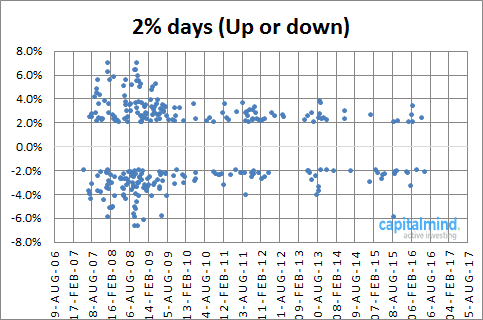 When you see it from this perpective, today’s fall was not that big a deal. What to do when you see the index fall? If you’re a momentum investor, you work the stop losses and figure out if you want to change them appropriately. 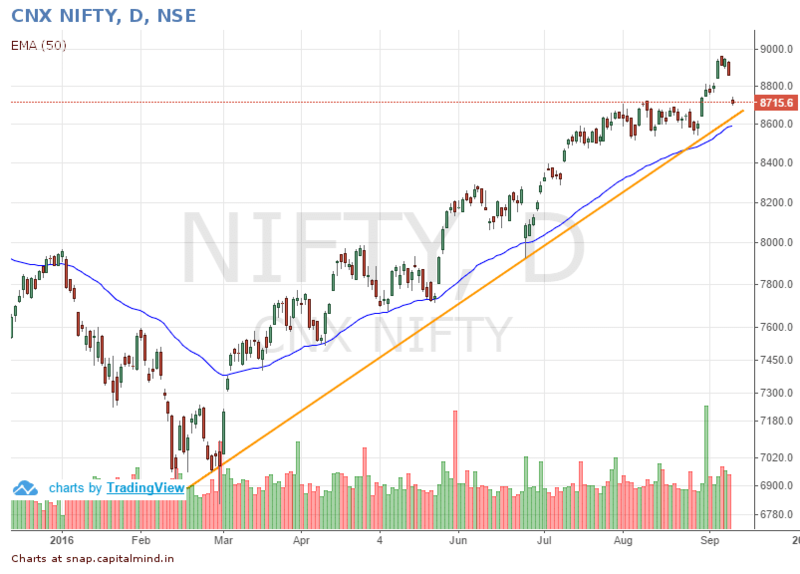 Overall, looking at the Nifty chart above, if there will be a fall, it’s going to fall a long way. So you can readjust positions by either reducing the number of positions or reduce the size of each position. It’s simple: sell until you can sleep at night, reduce leverage and keep gunpowder ready to be able to attack the market later. As a rational person, you’re probably already aware that this is not a big enough fall to make the valuations juicy, or to make it seem like there is blood on the streets. Much about panic is manufactured for conversation, not for action. Don’t confuse the two. But Gimme Conversation Stuff Also, No? Yes, of course. I think the Fed has been testing the waters. Will the markets shake it off that we are looking to hike rates? If the answer is “the markets are spooked” then they will find an excuse to delay things till September. But remember that all it will take is some US/ECB/BOJ official to come out and say “oh we were just kidding, low rates are here forever” etc. This is precisely how much there is in terms of the occupancy ratio of the tail with respect to the area between their legs. So then everything will go “Risk on” again and markets will go back up with a fury. Trading’s off tomorrow.India reacts to inflation numbers (coming at 5:30 pm) and then to US market changes, only on Wednesday. There will be a lot more to talk about. But until there is some real change in fund flows or rate changes, we shouldn’t think of drastic action.